When I returned to this small painting for the second time, I added some pink, which produced some orange and gold tones as well. These mountain landscapes are based on imagination and memories of growing up in Colorado. So I am not claiming realistic color. But in fact, I have seen the sun look red in a Rocky Mountain sunrise or sunset. And the rocks really do look pink in Colorado To be continued. . 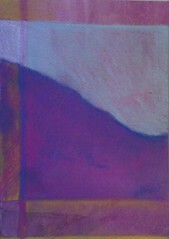 Here is another small painting I have been working on, a watermedia landscape done in acrylics. 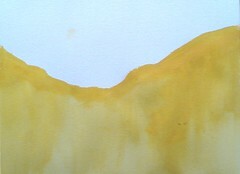 When I paint these mountain landscapes, I am usually working on more than one at a time. You have to let things dry in between steps to let the water do what it does. Working on more than one of these paintings at a time keeps me from getting impatient. I work on the next painting while I am waiting for the first one to dry. At the end of the painting session, I like to take a few minutes to start a new painting just before I go home. Then I never have to wonder what to work on when I go back to the studio. Anyway, here is how this little painting looked on the day I started to work on it. I took this photograph about two weeks ago, in mid-October. This was in late afternoon, at the edge of a wooded area. 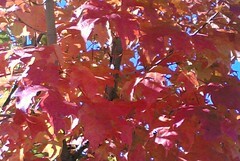 The red leaves are so amazing that sometimes I overlook the golden ones, so I decided to take this photograph. The late afternoon light was wonderful on the leaves. This is the image just as it came out of my cell phone camera. The recent windstorm, and of course the natural passage of time, have stripped most of the leaves off the trees. Time passes, leaves fall, but we can keep the photos and the memories that go with them. We are having a stormy day, with driving rain and wind. I like to try to photograph rain, but usually don't succeed. This image began as a photo I took with my phonecam. I cropped the image, and then decided the colors looked too faded, so I adjusted the mid-tones and hiked the saturation up a bit. I was planning to use this to make a cloned digital image with Painter's impressionist brush. But I decided not to do that, because I like the image as it is, and because the enlargement and cropping had already created a soft impressionistic effect. I already had what I was after: the way colors look in the rain, the softening effect of the weather, and the bright colors of shiny, wet autumn leaves. Yesterday I went to Red Brick to paint for a little while. 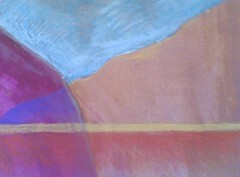 I went back to this painting, which I had started upside-down (white mountains, blue sky.) I decided to add sun, clouds, and pink highlights to this painting. I guess that makes this Step 4. To be continued. . . 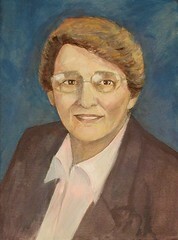 This is the portrait I am painting for my friends, as it looks now. I have been working on revising the features and adding detail, especially to the eyes and nose. I made many small changes, but I think they will pay off. I also made some small changes to the face shape (yes, again! but face shape is a very important part of how we recognize someone). There are more changes to the eyes and mouth that I plan to make at the next opportunity. This is still a work-in-progress, but here is what it looks like today. Here is the painting I have been working on, the one I turned upside-down. I decided I liked it better this side up, but still felt the composition was not balanced, so I added another mountain in the background. 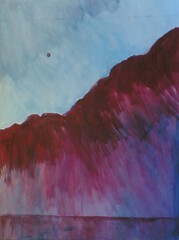 Then I added more color to the mountain in the foreground. That was step 3 and that is where I left it. To be continued. . . 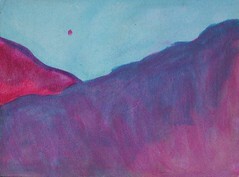 This painting started with the outline of a white mountain against a blue sky. But when I went back to Red Brick to work on it, I decided that although I liked the shapes, I didn't like the composition, mainly because of the placement of the shape of the mountain on the page. So my next step was to simply turn it upside-down, and here is what it looked like. To be continued. . . . Here is a painting I have been working at Red Brick. 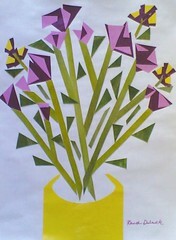 It is done with acrylic, used as water-media on paper. This is a landscape inspired by the Colorado mountains. 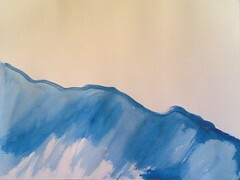 I began this one by painting the shape of the mountains and putting in the beginnings of a blue sky. 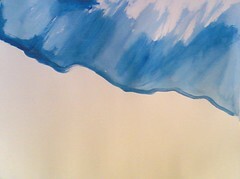 This is how it looked at the end of the first painting session. 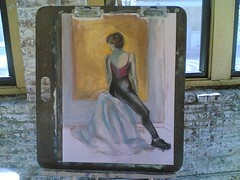 This weekend I went to a figure drawing session at Red Brick. We drew in the gallery, working from a clothed model. This work in progress is one of two drawings I did. Drawing the figure is one of the hardest kinds of drawing, and probably the best exercise to do because it improves everything else you draw or paint. I used to do a lot of figure drawing, and I would like to do more of it on a regular basis. I think this kind of drawing is like going to the gym to lift weights; although you might not see results each time you go, over time you see the investment you have made in yourself. This drawing was done with conte crayon, from a long pose (over 30 minutes). The model sat near the window and I liked the sunlight and shadow on the figure. I took this photo while the drawing was still on the easel. Our model said she wouldn't mind if I posted this on my blog. Until I moved to New England, I had never seen a blueberry plant. 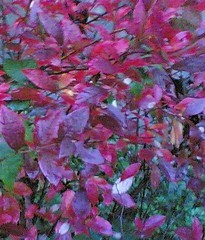 I certainly didn't know that they have beautiful bright red leaves in the fall. I have been trying to get a good photo of blueberry leaves, but I have been having trouble with the color. But yesterday, I had good luck. The color is just as it came out of the camera, although I cropped the image for the composition. 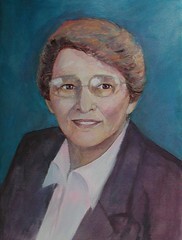 Here is the portrait I have been working on for my friends. For the past few days, I have been working on the face. I softened the eyes and opened them up a little. I also added detail to the nose and chin. And I made one more revision to the face shape, trying to adjust for the slight turn in the position of the face. Here's another of the small landscapes I have been working on. This is conte crayon and pencil drawn over acrylic paint on paper. The mountain imagery is inspired by memories of Colorado, my home state. Today on a late afternoon walk, I noticed the sunlight hitting the trees, creating a golden glow as it played on the autumn leaves. 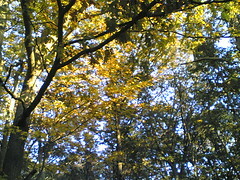 I took several pictures with my phonecam to try to capture the effect of the light on those trees. I don't know if I succeeded, but this is one of the best of my efforts. 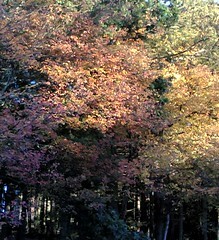 This image has been cropped to improve the composition, and to focus on the play of light and shadow at the edge of the wooded area. I went to the studio at Red Brick this morning. I only had an hour to spare, but I worked on three small drawings, landscapes "transformed" from an acrylic painting on paper that I cut into nine pieces, six by eight inches. I had fun drawing into the pieces with conte crayon and pencil. I don't know if this is the best of the three, but this is the best photograph of today's work that I got with my phonecam. 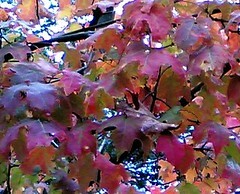 It is the peak season for fall color around here, and people travel long distances to see this. Lately, I have seen beautiful October leaves while running errands around town, driving up and down Route 128, or even driving to New Hampshire. 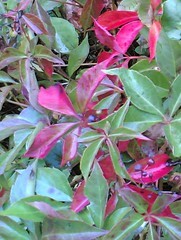 But one of the best photos of autumn color that I have been able to take is this one, taken at the local gas station! There was a small tree with bright red leaves by the fence, and I made a point of taking a picture because I knew I would be able to reach high enough to get a good view of the leaves. Tonight I cropped the image, then opened it in Painter IX to clean up one little distracting mark, using digital chalk. Sometimes you don't have to travel very far to see something amazing! 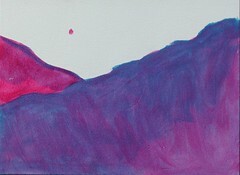 This small drawing is part of a series I started this week at Red Brick. 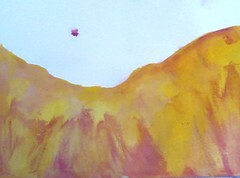 At home, I had found an abandoned painting (acrylic on paper), the beginning of a figure in pink and orange. I had started it in a class as an assignment, I think. So I took the painting to Red Brick, just intending to cut it up for collage. 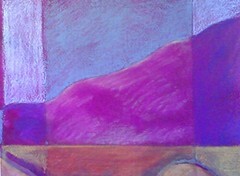 Looking more closely, I saw areas I liked, so I planned to crop them out and draw into them with conte crayon. Then I decided to just divide the painting into nine small pieces, six by eight inches, and work with whatever composition resulted in each rectangle. I drew the lines with pencil and T-square; instead of erasing the marks and lines, I decided to draw more lines in pencil, and then used conte crayon to add color. This is one of three drawings I worked on so far. Although I photographed the pieces reassembled into their original positions in the painting (I numbered them), I am not paying attention to that in my drawings. ( In some cases, I am turning them upside-down or sideways.) But the shared color scheme, technique, and subject matter will make them into a series. The way this project started is not that important, but it made me laugh and it is fun to see what I can do with each composition, determined by the random measurement. 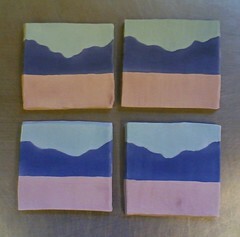 Here is another set of coasters that I painted at Red Brick for their upcoming fundraiser. 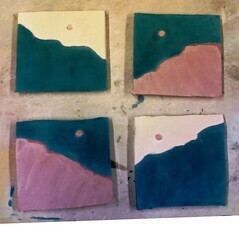 These are in progress because they are not yet fired. The shapes and colors remind me of the way the Colorado mountains look along the Front Range, even more so when all four are lined up horizontally. I like to finish my collages with acrylic gel medium, but it always makes me nervous to do it. When the medium is wet, it always looks to me like I have just ruined the collage because the paper can curl up and bubble and look distorted. That is exactly how I felt when this piece was wet, so I was anxious to see how it would look once the acrylic medium dried. I was relieved when I saw it dry, and this is how it looks finished. I had fun making this collage, and I think I may do some more. 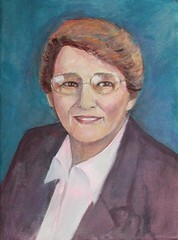 I worked on this painting yesterday, a portrait I have been painting for my friends, and this is how it looks now. I added a transparent pink wash to the face, but otherwise left it alone. I worked on the blouse, painting in the shape with soft colors. Then I put a thin wash of purple over the jacket. I was looking through some of the photos I have taken lately, and decided to post this one today. It is from a recent walk in Long Hill Gardens on a warm autumn day. I love to stand under the grape arbor, which is just what I did to take this picture with my phonecam. 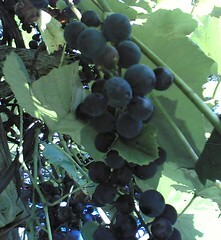 Tonight I cropped the photo to focus on the grapes and the sunlight hitting the leaves. Last night, my daughter and I made what has become our annual visit to the Topsfield Fair. It makes me feel like a kid to go to the fair, maybe because it reminds me of going to the Colorado State Fair when I was growing up. 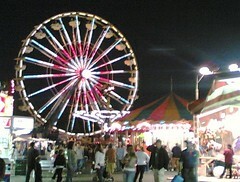 Yesterday was the last day of the Topsfield Fair, and we didn't get there till after five. But we had great weather, and had great fun in a short amount of time. We sampled strawberry shortcake, fried dough, and apple cider, and watched a greased pole climbing contest. By then, it was getting dark, and the lights were coming on in the midway. I love to watch the rides, and I took lots of pictures with my phonecam. Tonight, I edited my photos on the computer, and decided that this is the one I like the best. This is how this painting looked after my third opportunity to work on it. 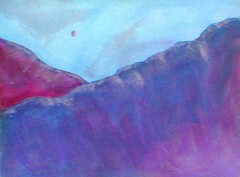 I added some pink to the sky, to suggest clouds, and some highlights to the mountains. Better, I think. Sometimes a little bit of paint can make a big difference. This is a work in progress. I went back to this little painting of the Colorado mountains for the second time, and here is how it looked when I was finished for the day. I added some blue washes to the sky as well as to the mountains, just to add layers to the color and to develop some depth. This little painting is a work in progress, done with acrylics used as water-media. 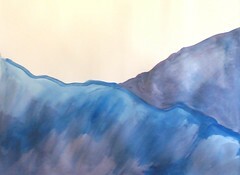 I love to paint the mountains, working from imagination and from memories of Colorado. I started this little landscape several weeks ago, and keep coming back to it. This is how it looked on the day I started it. I love to see the fall colors around here. This time of year, you can see beautiful colors when you are stuck in traffic on the highway, as I have been recently, or just walking around the neighborhood. Here's a photo from a recent morning walk. I used my phonecam for this shot, then cropped it tonight to get this composition. Tonight I went to Red Brick to paint coasters again for an upcoming fundraiser. It was fun to work with the other artists around the table. This time, the little tiles had already been fired (bisque), so all of our work was painting (no carving into the clay was possible). We were encouraged to make sets of four. (These can be hung on the wall or used as coasters). Here is the set I made tonight. I wonder how they will look once they are fired. . . . This morning I went to Red Brick for a bit. I decided to try to finish up this little collage. Ever since I added the little yellow petals, I have been trying to figure out how to make them fit with the rest of the piece. To get the yellow to show up against the white background, I added dark pink. I also wanted to do something to keep the flowers from floating. 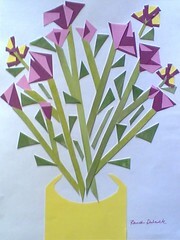 I started playing around with paper and scissors without a solution in mind, and this is what I came up with. The cylindrical shape suggests a vase and the color echoes the yellow flowers near the top of the piece. I decided I was satisfied so I signed and photographed it before coating it with acrylic medium. (I thought it would be too wet to photograph well afterward, which turned out to be the case). Now at least I have the digital image, in case it doesn't dry well. I went to Red Brick this morning to paint. 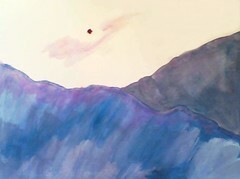 I worked on this painting again, a landscape inspired by the Colorado mountains. Today I used horizontal lines across the top and bottom to break up the vertical format. These lines can suggest the straight lines we see in the landscape: jet trails, roads, fences, lakes. A vertical format is difficult to use for a landscape, but I like it because that's the point of view you get sometimes when you are in the mountains. Lately the night air has been chilly, although sometimes the afternoons are still warm. We are beginning to see some red leaves. 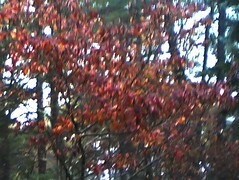 Last week at Long Hill Gardens, I used my phonecam to take a picture of these bright red leaves and purple berries. Once I had the image in the computer, I cropped it to get the composition the way I wanted it. But I didn't touch the color. This is the image just as it came out of the camera. I took this photograph on a recent walk, right after it had stopped raining. 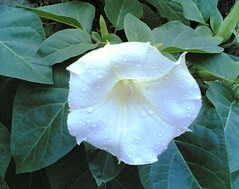 I loved the look of the raindrops on the soft white flower. I wonder if this a squash blossom. From the position of the leaves and the location of the plant, it looks like it might be. But I saw no sign of squash growing there, but just a little feast for the eyes, and food for the soul.